We love to have company for dinner. In my opinion six is ideal for everyone can participate in the same conversation -- with any more and you often have "two" tables -- the middle guests participating in both while each end has their own conversation. Often we set the table without a tablecloth using chargers instead for we like the look of wood. For this dinner party, we used our blue and white Spode, yellow napkins and our big wine glasses. Our oriental candleholders and three of our antique julep glasses held a yellow and white arrangement of garden flowers -- honeysuckle, coreopsis, and butter and eggs as well as the seed heads from the sorrel in the herb garden. We started with martinis and appetizers in the breakfast room. Skewers of appetizers topped the martini glasses (husband's idea) -- roasted shrimp on each end, pickled garlic, two kinds of cheeses, cherry pepper, pickles, a cherry tomato. Dinner was salmon cooked simply by searing and finishing in the oven and topped with a dill cucumber sauce when it was served, potato torta (three kinds of potatoes tossed with rosemary and olive oil and layered with Parmesan cheese and baked in a springform pan), and green beans with roasted red peppers. Dessert was a strawberry tart. It was easy to make and made a great presentation. Although the recipe called for several fruits I chose to use all strawberries. I brought it to the table whole for it is an awesome looking tart. The filling is a white chocolate and cream cheese mixture which went really well with the strawberries. 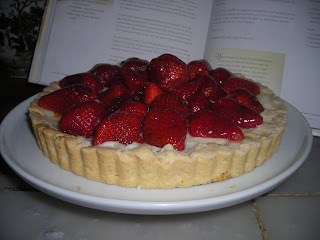 We were enjoying ourselves so much that we opened a precious bottle of Late Harvest Gurwerst to go with the tart and it was a perfect compliment to the strawberries and chocolate. 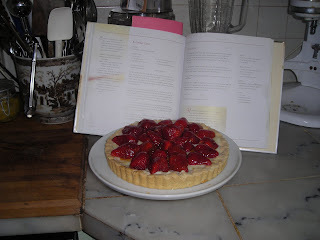 It's an easy tart and I will definitely make it again. Pastry: Beat the butter an dpowdered sugar together until blended. Add flour and beat until smooth. Press the pastry over the bottom and onto the sides of a 12 inch tart tin (I used a 10) Bake at 300 degrees for 20 to 25 min. cool. Combine white chocolate chips and cream and microwave for 2 min and stir. Add cream cheese and beat until well blended. Spoon the filling over the baked layer. Combine the sugar and cornstarch in a small saucepan and mix well. Stir in the pineapple juic ean dlmon juice. Cook over medium heat until thickened, stirring constantly. Drizzle glaze over all the fruit to prevent browning. Chill, covered in the regirgerator. NOTE: I melted orange marmalade (a cheaper version without a lot of orange peel) and thinned it with Grand Marnier for my glaze. Martha, your table is lovely, and the food sounds delicious. What a wonderful night for your friends. I agree about six vs. eight for the reasons you give. Also, dishes for eight take a whole lot longer to clean up afterward. For some reason just those two more place settings are a lot!! I love that tart and will definitely make it. Thanks for sharing the recipe.